The 4th edition of Copyright Matters! was published in 2016. Copyright Matters! takes into account the changes made to Canada’s copyright law in 2012 and the Supreme Court decision on fair dealing in the same year, and provides practical information for teachers on their rights and responsibilities with regard to the use of copyright-protected materials in educational institutions. Students, parents, and education administrators may also find it useful. 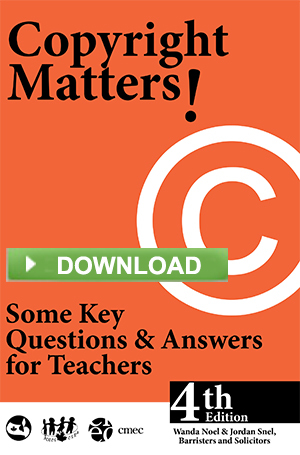 Download your copy of Copyright Matters! If you would prefer to have a printed copy of the new edition of Copyright Matters!, please contact us. If you would like to be notified when new materials on copyright become available, please join our InfoCMEC electronic mailing list.